By now the story of Steven Slater's dramatic exit from a JetBlue airplane at JFK airport in New York is well known to most of the traveling public. While only Mr. Slater knows why he allegedly chose to deploy an emergency slide, leave the aircraft, and abandon his duties as a flight attendant, it is quite clear that what he did put ramp workers at risk and cost JetBlue many thousands of dollars. Normally, these kinds of antics rarely get noticed outside of the aviation press, but as is often the case with the airline business, things that happen in an important media market like New York can get way more than the average amount of attention. 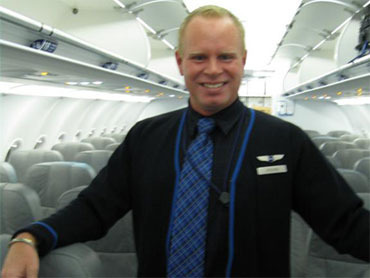 Overnight, Steven Slater when from anonymous flight attendant to getting Lady Gaga levels of attention. Some call him a modern working class hero for doing what he did. I however have a much different point of view. Those of you who were around in the late 1970s probably remember the Johnny Paycheck song, 'Take This Job and Shove It,' a huge hit about a working man fed up with his lot in life. The song struck a chord with anyone who had had to deal with a frustrating job situation and dreamed of one day having the courage to stand up and tell the boss what he or she could do with their job. There is little doubt in most passengers' minds that air travel isn't as much fun as it used to be. The stress for airline employees is probably much higher as well, with prospects for future pay raises, pensions, or decent benefits dimmer than ever. Any employee who gets to the point where he or she would rather quit the job and take a chance on the open market than to continue with their daily routine, has a rare kind of courage that should be applauded, even if they give the boss the finger on the way out the door. However, Steven Slater alleged acts shouldn't be commended, they should be condemned. Leaving your flight attendant job for the last time by allegedly opening an emergency chute when there is no emergency put ramp workers at risk. 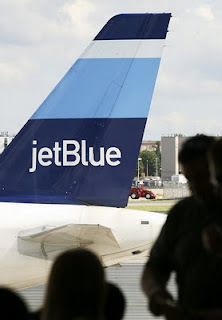 The money and resources spent to repack that slide and put the aircraft back in operation have to come from somewhere, most likely from his follow JetBlue employees who may have fewer pay and benefits, or future JetBlue passengers who may have to pay a bit more for their next flight. By coincidence, the same week that some in the media are spending time 'reporting' about how some members of the public consider Mr. Stater to be a hero, there is a group of individuals who are far more deserving of the title of hero who are getting much less media, but who are about to receive some well deserved thanks from the public. In San Antonio, the nonprofit group Alamo Honor Flight, which is part of the Honor Flight Network, provides World War II veterans with trips to Washington, DC, giving these veterans an opportunity to visit many of the area's memorials and also as a way of thanking them for their service. Tomorrow (August 13, 2010), a group of these veterans from the San Antonio area are heading off to Washington on the latest Honor Flight trip. No doubt, many of them faced stress and frustrations while they did their duty. Some faced enemy fire, while others served their country in spite of not having full rights as citizens. In the decades after the war, they continued to serve their communities and their nation in spite of all the obstacles that life may have thrown at them. I'm fortunate to know one of them very well. You can read more about my father the former Marine at AirSafe.com. You can also look at the videos below to find out more about the Honor Flight program. After reading this story and finding out more about the Honor Flight veterans, you may want to ask a question that I asked myself. Knowing what I know about Steven Slater and about these Honor Flight veterans, who would you want in the airplane with you if there was an emergency? Whose judgment would your trust in a tight situation with lives on the line? Even if those veterans were confined to a wheelchair or barely able to walk? Personally, I would choose any one of them over Slater any day of the week. If you had a similar response, then you know why I think Steve Slater is no hero. What the author of this article forgot to include is they are a PR rep for the airline. Capt. Sully & his crew are true heros, not Mr.
Disrespectful and inconsiderate attitudes towards others, others that are not to blame, are often glorified as far as there is some reason that can be perceived as worthy in itself. It is a kind of "ends justify means" attitude by people who routinely declare their abhorence to such a philosophy. Hypocricy sheltered egocentro-narcissism is killing western civilization. I am a retired aircraft tech and what Slater did, does not deserve possible press. His action was selfish in not thinking the harm he could cause to ground personell. He should also be charged with sabatage. Now for the PR comment. That sounds like a disgrunted airline employee. That was a good deed needing front page exposure. I believe that the message being delivered is that it is far past due for "some" of the general public to stop feeling the right of entitlement. If someone hit you in the head in a restaurant the least you would ask is an apoligy. I enjoyed his ex wife being interviewed on the Today show expressing that flight attendants are placed on airplanes to save your life should it be necessary, they are simply providing snacks/drinks etc during the flight when they are fortunate enough not to have an emergency, heart attack, panic attack, shock, etc. to handle. The blessing is that Mr. Slater did not choose other extremes like the people who use a gun to make their point. Yes, someone might have been hurt...but they weren't ...thank God...We can always use What If? to not acknowledge the problem itself. Wikipedia defines "heroes" as - Characters who, in the face of danger and adversity or from a position of weakness, display courage and the will for self sacrifice—that is, heroism—for some greater good of all humanity. This definition originally referred to martial courage or excellence but extended to more general moral excellence. Slater did none of those things. That characterization by the media was exaggerated and just plain wrong. Are you saying that if a plane is at the gate it shouldn't be evacuated because it may injure people on the ramp? Dr. Todd Curtis from Air Safe, your comments have me asking, HOW CAN THIS INDUSTRY PREVENT THIS IN THE FUTURE? That question might have solicited some preventative measures from others. Thanks for you biased opinion however, it was interesting. We all go mad at some point in our lives! but the question is why? perhaps we all need a little love, friendship and intamacy in our lives... including our employeeeeeees!!! Mr. Slater acted like a child. The passenger was disgusting and rude and the whole thing was pathetic. Why the news would give this so much coverage when we have far more pressing issues facing the country, shows that much of the news media has descended into a bunch of morons. Mr. Slater needs to retire but pay for his usage of the slide; the passenger needs to be publicly humiliated and his picture splattered all over the news like the flight attendant and then everyone needs to let it go. The lesson here is: when the plane stops, everyone needs to chill, take their time to not hurt anyone in their haste to exit the plane and certainly the flight attendants need to be nicer; for this I will personally attest. When I get a nice one on a flight, I am surprised and always compliment them for making my journey pleasant. What happened to courtesy, manners and the golden rule? Society seemed to have regressed rather than progressed in civility. Everyone get a grip and get on with it. I might agree that Mr. Slater is not a hero. Neither is the slimeball passenger who insulted him. The concrete fact is that airline crews are stressed to the limit (and beyond) nowadays and the airlines need to address the situation immediately. Oh, I forgot, nobody cares about safety, comfort and efficiency anymore. Silly me. So let's keep terminating pensions and slashing pay and benefits. As former TWA Tech who worked gate 7 when it was the former TWA Domestic Terminal, I wish to explian the full ramification of what might have happened. Many times an aircraft at that gate would have had an external power unit as a GPU running while being attached to the electrical receptacle of the aircraft while out going Flight Crew members and Aircraft (Avionics Technicians would also be in the area (entering the forward Electronics Compartment)where this chute was depolyed. There absolutely no doubt that it was a miracle that no one was in that area at that particular time otherwise, there could have been the lost of life. I am so awed by the absence of the FAA's investigation or application of Fines to Jet Blue and this deranged flight attendant. gives wrongful insight to any future committment of terroism. I feel there should be an investigion of why the FAA has not responded. As a flight attendant, I must agree with most of the posts. Slater is no hero and showed poor judgement. In our line of work, we have to put up with insults & rude passengers. Most people are nice, considerate of others and are appalled at bad behavior. What he should have done: Continued the flight in a professional manner, discretely written down the seat number of the passenger involved, reported it to his Captain and the airline. People who are disruptive CAN BE banned from flying on your airline. Aside from the flight crew, other passengers shouldn't have to deal with bad behavior. Passengers look to you, as their crew to handle situations calmly and correctly... how else would they be assured you can take care of them in an emergency situation? What Mr Slater did was wrong and could have killed ground crew personnel. What was he thinking that prompted him to react in that way? No matter how rude the passenger was Slater's action was not justified. Like Trump says Mr. Slater "Your fired!!!!"